Do you know the interesting story of Jason and his quest to find the Golden Fleece? It is a story of courage, intelligence, love, betrayal, and revenge. Know all about it in this Historyplex post. The ship Argo had a sacred oak tree branch blessed by Goddess Athena, which could talk in a human voice and render prophecies. Greek mythology has a lot of interesting stories; those of valor, love, deception, and tragedy. One such story is of Jason and his quest to get back the Golden Fleece. It is one of the most popular quests in Greek Mythology. The Gods and Goddesses played a major role, albeit indirectly in such quests. For example, Jason's quest was all a master plan of Hera to avenge her insult. 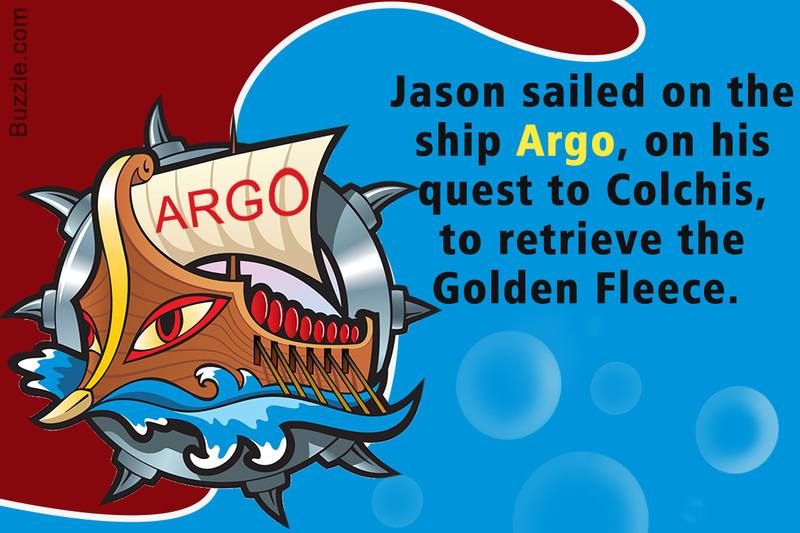 Keep reading to know about the exciting journey Jason and other heroes undertook to retrieve the Golden Fleece. ✠ Jason was the son of Aeson, the King of Iolcus and Alcimede. Aeson's mother was Tyro, daughter of Salmoneus and sea god Poseidon. Aeson's step-brother Pelias was hungry for power. He usurped him from the throne, and became the king of Iolcus himself. ✠ Jason's mother acted as if Jason is dead and grieved for him with other women. Thus, Pelias was fooled. Jason's father was imprisoned and he was sent to Chiron, the centaur. Chiron taught him hunting and various arts. ✠ The Golden fleece was the wool of Zeus's ram. He had gifted the ram to Phrixus. ✠ Phrixus flew the ram from Greece to Colchis as his stepmother wanted to kill him. The golden ram saved his life. ✠ In Colchis, Phrixius sacrificed the ram to Poseidon, the sea god. The ram was actually sired by Poseidon himself. ✠ The fleece got a special groove in Colchis, and King Aeetes guarded it with bulls that breathed flames and a dragon who never slept. ✠ It was extremely sacred, and was a symbol of authority and power. ✠ King Aeetes believed that until the fleece was safe, nobody could threaten him or his kingdom. ✠ Hera, wife of Zeus held a grudge against Pelias, as he had honored all the gods except her. She wanted to avenge her insult. Involving Jason was all part of Hera's master plan. ✠ Jason came to Iolcus as a raging storm. On his way he saw an old lady, who was Hera. He carried her on his back, and realized that she was unexpectedly heavy. While some sources say that Hera revealed her true self to Jason, others believe that Jason had no idea who she was. ✠ Jason lost one of his sandals in the river. This incident was very important, because Pelias had been warned that a man with one sandal will take away his throne. ✠ Jason finally went to his uncle and requested him to give back his rightful throne. Pelias told Jason that he will give him his throne if he got the Golden Fleece from Colchis. Actually, Pelias never expected Jason to complete such a dangerous voyage. ✠ Jason asked shipmaker Argus to make a sturdy ship for the arduous journey. Argus, who wasn't known to be very humble, named it Argo, after himself. 50 heroes went on the quest to get back the fleece. ✠ Jason was their leader, and brave heroes like Hercules were a part of this daring group. Some of them were Hylas, Zetes, Calais, Orpheus, Castor, Polydeuces, Peleus, Telamon, and Atalanta. ✠ Their 1st stop was the island of Lemnos, which was inhabited by women. Apparently, these women insulted the Goddess Aphrodite, and hence were cursed by her. Their husbands ran away from them as their bodies stank really bad! As a revenge, the women killed their husbands, and lived alone on the island. The women requested the Argonauts to help them repopulate the island, and the heroes happily obliged. ✠ Next, they met Phineus of Salmydessus, who was harassed by the harpies. Harpies were creatures who had faces of women, but bodies of birds. They used to steal Phineus' food and defecate on his dining table. The poor king had grown weak, as he could barely eat in peace. Jason and the heroes decided to help him get rid of the harpies. Zetes and Calais, the sons of north wind, chased away the harpies. Finally, Phineus was relieved and enjoyed a meal in peace. He helped them with the location of Colchis, and also warned them about cliffs of Symplegades. ✠ The cliffs of Symplegades were notorious as they crushed anything that passed between them. The Argonauts decided that a bird will pass through the cliffs, and Argo will follow closely. As soon as the cliffs close, Argo will quickly pass. Thus, the plan was successful, and the ship passed with very little damage. ✠ Finally, the Argo reached Colchis. King Aeetes of Colchis was wary of strangers, and assumed the group to be his enemies. Somehow, Jason convinced him that all he wanted was the Golden Fleece. The king told him he could take the fleece if and only if he completed three tasks. ✠ Medea was the daughter of King Aeetes. She fell in love with Jason as soon as she saw him. Well, the credit should actually go to Aphrodite, who used her power to entice Medea. ✠ Medea helped Jason and other heroes complete different tasks, and get back the Golden Fleece. She played a pivotal role in Jason's quest. ✠ The first task was to harness two bulls and make them plow the field. You must be thinking, that's pretty easy! But, the bulls were not normal bulls, they used to breathe fire and had feet made of sharp brass. But Jason had no worries, as Medea was a sorceress. She gave him a magic potion that made him immune to fire and metal. Thus, Jason completed his first task. ✠ The second task was to sow the seeds, which were dragon teeth. Instantly, the seeds germinated and warriors came out. Jason used trickery to get rid of them. He threw a stone at one of them, and they started blaming each other, and fighting amongst themselves. ✠ The last task was to tame the dragon that was guarding the fleece. Jason used a magic potion given by Medea and the dragon fell asleep. Thus, Jason completed all the tasks. ✠ But Aeetes wasn't ready to give the fleece. Hence, Jason and Medea stole the fleece at night and escaped from Colchis along with the Argonauts. King Aeetes tried to chase them, but Medea killed her own brother to distract them. ✠ The Argonauts successfully completed the quest and returned to Iolcus. Jason married Medea. ✠ Due to Medea's magic and her reputation as a sorceress, they were thrown out of Iolcus. They went to Corinth. ✠ The king of Corinth offered his daughter's hand to Jason, and Jason accepted the offer. This obviously irked Medea, and she killed his new wife. She also killed her children and got married to Achilles. ✠ Jason was extremely upset and sad, and was resting under his beloved ship Argo. He met a very tragic end when the beam of the ship fell on his head, and instantly killed him. This was the story of Jason and his quest to get the Golden Fleece. Like most Greek stories, it is a story of courage, revenge, and passion, with a very tragic end.